When I dropped in on an episode of The Leftovers at The A.V. Club earlier this season, it was cathartic: after weeks of watching but not writing about the show, it was nice to have a space to confront the series’ opaqueness. But as I return to confront the finale, I’m wondering if I had it all wrong. On the surface, The Leftovers struck me as a series that begs us to analyze it, full to the brim with characters with uncertain motives building toward something and yet nothing at the same time. What’s the deal with Wayne? What drives the Guilty Remnant? Those questions at first seemed to bear fruit as it related to the themes of the series: even if we ignore the existential question looming over the entire series, these other questions funnel back into the meaning of the departure and accumulated considerable meaning as the season wore on. That meaning was a smokescreen. 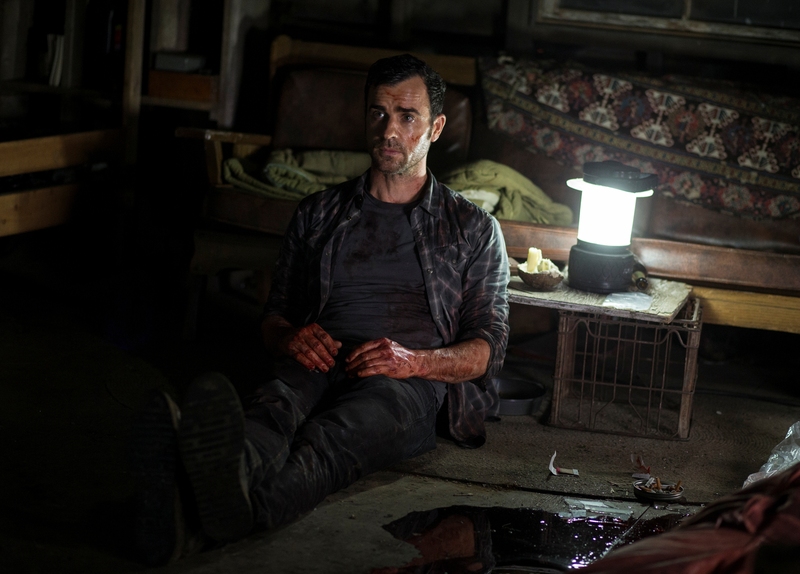 It was a powerful one, granted, but as The Leftovers concludes I’m struck by how little separates a show that begs us to analyze it from a show that resists all analysis. Say what one will about Lost, but it wanted us to be invested in its mysteries, and even in the end sought to give purpose to our investment even if that failed to appeal to all viewers. By comparison, however, The Leftovers built a house of cards that it knew was going to burn away by the end of the season, leaving behind characters we relate to because they too were caught up in the construction. They lived through what we lived through, and must equally confront the landscape that revealed itself when the house burned to the ground. It was in those final moments that the show finally revealed its hand, and for the first time as an entire series became legible, and real, and open to the kind of analysis it had nonetheless inspired while resisting such visibility. And the result was compelling, if also guilty of building a neater circle than it necessarily needed to. At this point, Cougar Town is sort of like a history lesson. This isn’t to say that I had forgotten that Jules and Bobby were once married, and that the former has been paying alimony to the latter, but it hasn’t played a role in the show’s storytelling since the Cul-de-Sac Crew came together. We’ve just sort of accepted Bobby as a fun guy who lives on a boat, and since finances have never been a major concern for the show it’s not as if there’s any real question of whether the alimony will make or break the show. Rather, it becomes the latest in a series of investigations which return to a storyline that could disrupt the series’ dynamic and then prove that it is not going to actually disrupt the series’ dynamic. And while I do think that “Keeping Me Alive” is pushing the pattern a bit too heavily, and the show will have to introduce an actual storyline at some point, there’s enough to keep this episode grounded for me to continue to sing the show’s praises. When Cougar Town changed (for the better), it could have completely ignored its past: considering that Jules dating younger men was a failure, there was every ability for the show to just pack up and move on. However, while the show did change its focus to the community developing amongst the characters, “The Damage You’ve Done” actively unearths the show’s past. Jules runs into one of her ex-boy toys, someone who I had completely forgotten existed, and the show returns to an event that I had no recollection of which it could have swept under the rug. And yet, in some ways it’s Lawrence and Biegel showing off: they’re sticking their tongue out at the skeptics, proving that the community they’ve developed is strong enough to withstand explosive secrets. However, at the same time, the episode is not without its consequences, maintaining the sense of weight that the show has carried even as it has established its casual atmosphere. I am officially to the point where I am done “defending” Cougar Town: I refuse to accept that anyone who has recently watched the series could think it is anything but honest, earnest and hilarious, and so I’m just going to pretend that there are no naysayers out there. While many turn to Modern Family for their television comfort food on Wednesdays, for me Cougar Town manages to hit the same emotional notes while abandoning neither the honesty nor the snark. There is nothing complex about “All Mixed Up,” largely relying on the strong interpersonal dynamics that developed over the course of last season, but the episode says something about those dynamics in light of recent changes. It successfully makes the argument that while their relationships will sustain them through any number of challenges in life, it will not be able to make it so that those challenges don’t exist. This is a starkly honest show (as I note above), and this allows them to say something tangible and real about their characters without introducing false conflict. In other words, things aren’t “All Mixed Up” at all. Jules Cobb loves plans. She makes the argument in “Finding Out” that plans make everything better, an argument which is proven correct as an elaborate plan at the end of Cougar Town’s first season finale ends up working just as she and Grayson had predicted. Of course, the irony is that Cougar Town is a show which threw out its plan early on in its first season – I’ve written enough about the show’s transformation to not necessarily feel like going over it again (Todd VanDerWerff’s review of the finale nicely captures it, also), but suffice to say that the show is completely different now than it was when it started. However, rather than one plan being replaced by another, the show has largely gone without a plan: sure, Jules and Grayson eventually got together as the show seemed to be gesturing towards, but each episode doesn’t feel like it’s playing into a particular formula, or that it’s forcing characters into particular moulds. Rather, each episode seems like it stems from characters hanging out, or characters dealing with facts of life, or characters just acting like human beings and following their whims. “Finding Out” has all of the show’s characters struggling to figure out how to manage what is unquestionable a “plot development” which threatens to undermine the show’s sense of laidback stability, and Grayson does come up with a plan that allows them to micro-manage the situation to their benefit. However, the way that plan plays out within the show itself is so wonderfully handled (and the rest of the episode around it so gosh darn fun) that the balance never wavers, and the show handles its transition into a new era and into a second season with the same confidence that it has showed in recent episodes. In other words, there’s no better time than the present to get caught up for September. I am officially nearing the point with Cougar Town where I may make it my personal crusade to travel across the country in order to force every person who gave up on the show in its (admittedly pretty bad) early episodes to sit down and watch an episode like “Letting You Go.” As a show which seemed to begin with tired archetypes, I can see why people were perhaps impatient with the series, but these characters are real people now: while Modern Family has a set of dynamic character types that offer plenty of storytelling opportunities, characters on Cougar Town evolve and change in life the same way that J.D., Elliot and Turk changed through medicine. “Letting You Go” is a careful negotiation of the show’s central relationships told through a combination of some bare bones emotional realities and some ridiculous, over-the-top sequences that would seem like dream sequences on any other show. That the show is capable of achieving this makes it all the more impressive, and makes me all the more sad that people who would truly love this show let it go before it really had a chance to shine.